The Ultimate Fighter brand has appeared to be on the wane for quite a while. Some put it down to the quality of fighters who compete on the show, some put it down to the repetition of the tournament played out as a reality television series, but UFC have certainly pulled out all the stops this season by placing one of their most captivating stars in a coaching role. ‘The Notorious’ Conor McGregor can barely open his mouth without creating international headlines at this point, and he and former WEC champion Urijah Faber clearly have the right chemistry to bring a mass audience to the TUF brand based on the premiere. Tempers didn’t flair dramatically, but the back and forth between the two certainly made for entertaining viewing throughout the first episode. After their famous altercation before the UFC 189 weigh-ins at the MGM Grand, the two coaches wasted little time with formalities, with McGregor claiming that the Team Alpha Male fighter should “be glad” that he doesn’t have to face him at the series finale on December 11. “Just be glad that you don’t have to face me, that’s all I’ll say,” McGregor told Faber as they watched the first round of fights. “I believe I would kill you stone dead,” McGregor replied. “You’re the worst on your team, that’s got to sting,” McGregor added. Later on in the episode, McGregor threw out the idea of the two meeting in the TUF gym to have a private bout for “a bag of cash” after Faber described how easily he could beat him. “I could probably beat him with one hand,” said Faber at one point. Although they might have played second fiddle to the all-consuming coaches, the first round of fights was very entertaining. Jiu jitsu phenom Ryan Hall got the party started early with technical showing that saw him claim victory by heel hook to seal his place in the house. Thanh Le showcased his spectacular striking style against Andreas Quintana to secure his place in the house while McGregor’s chief sparring partner Artem Lobov dropped a decision to Mehdi Baghdad after a two-round battle. Chris Gruetzemacher showcased his devastating power as he put away former Bellator fighter Austin Springer and former Cage Warriors standouts Saul Rogers and Martin Svensson also booked their places as competitors for McGregor’s Team Europe. Faber has been well regarded for his coaching role at Team Alpha Male over the years, but McGregor’s credentials are somewhat of an unknown. Despite not winning his fight on the premiere, teammate, close friend and chief sparring partner to ‘The Notorious’, Artem ‘The Russian Hammer’ Lobov spoke about what McGregor brings to the coaching table at a screening of the first episode in Dublin. “He knows the game so well. He’s been in the fight business for a very, very, long time,” said Lobov speaking at an advanced screening of the premiere hosted by Setanta Sports in Dublin. “He’s a great motivational speaker, so in that sense he really knows how to get you going for a fight. He’s really great to have around in that respect. The episode ended with Faber winning the coin toss to establish which team will get to pick the first fight. To add to the drama, a clip of Dana White offering the two coaches an opportunity to bring one fighter back who didn’t make it through the knockout stages was shown as a preview for next week’s episode. There is no shortage of critics of the outspoken Irishman, but there is no doubt that his exchanges with Faber will make this season one of the most internationally viewed in the history of the reality TV show. 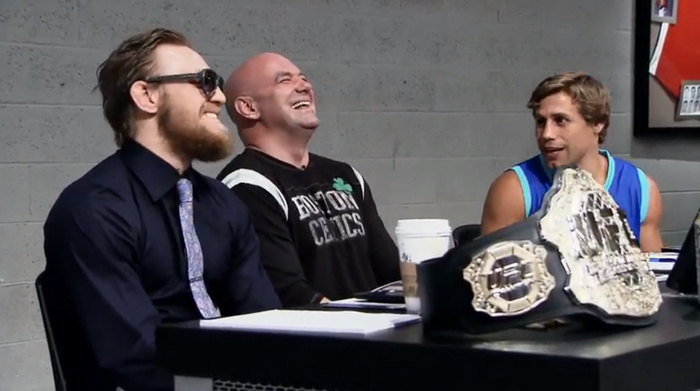 Brace Yourself For "The Ultimate Fighter 22," AKA "The Conor McGregor Show"